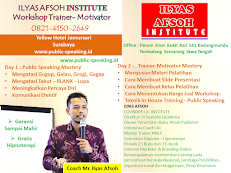 Are You Looking For Information Public Speaking Training? Do you want to Public Speaking Smoothly, and Confidently? How to resolve Anxiety, Nervousness, Grogg, Forget - Blank during Presentation? How Does It Affect Your Audience? How to Lead an Effective Meeting? " Powerful Technique Giving Greeting -Without Preparation. Tips on Delivering an IDEA and being accepted by your Audience. And maybe the various questions you want to ask about Public Speaking. What is Basic Public Speaking Training? Basic Public Training is a basic training program for beginners public speaking. What you get from Public Speaking Training? In this Public Speaking Training you get the Important material lessons Public Speaking Technique, This lessons Public Speaking Technique material is suitable for you as Business Owner, Director, Manager, Supervisor, Employee, Parent, Teacher, Lecturer, Public Speaker, Orator, party leader, wife officer, New and anyone interested in Public Speaking. WHAT WILL YOU LEARNED ??? "As a Lecturer at UIN Walisongo, I improve my presentation skills for students by joining Private Speaking Private Program at IAI, Thank you Pak for the sciences, no loss to study here. 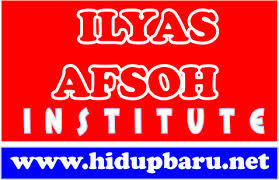 Moreover there is a free bonus hypnotherapy increasingly adding to my PD, "
Mrs. Sicha's - Lecturer UIN Walisongo Semarang. "As a hypnotic Trainer, I need public speaking knowledge so that my teaching is more hypnotic and in accordance with the rules of the correct structure of public speaking,"
Micah - Hypnosis Instructor Indonesian Board of Hypnotherapy. "Satisfied Join this training Public Speaking material is easy to understand and can be applied immediately." "It turns out that talking in front of many people is easy yes, as long as you know how. Tips and stances are very applicable for someone like me "
"For a long time I was interested in the world of public speaking, and happy to finally be accommodated in IAI Public Speaking. Appeals- Easy - Applicative. " Mr. Widodo PNS Lumajang East Java. "I became Confident and can cope with groggy when in front of many people. thanks. Very helpful. Recommended "
Fachri - Management Entertaint Jakarta.